Grosbeaks are slow-moving birds, deliberate in their motions and show little fear of humans. Boldly colored males are a treat to watch at your feeders even though their appetites can match their body size. All females are dowdy by comparison, in shades of drab brown, olive- or grayish-green. 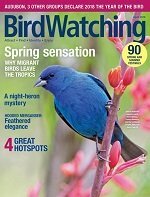 Reviewing these birds of North America is not as simple as it might seem because our five species are not all closely related. The Rose-breasted and Black-headed are east/west ecological equivalents, but the blue is more closely related to buntings. 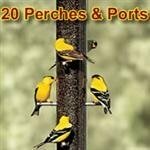 Evening and Pine are classified as finches. What they all have in common are enormous seed-cracking bills. When the Rose-breasted visit my feeders in the spring, they become my favorite birds. The bright red triangle on the breast rivals the spectacle of a male scarlet tanager. Rose-breasted nest in eastern and midwestern forests. Unlike most song birds, the male Rose-breasted shares incubation duties with the female and even sings while he's doing it. Although Rose-breasted does eat seeds and fruits, they probably eat more insects than most others. 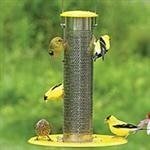 At feeders, they relish sunflower seeds. Though my yard sits right on the edge of the woods, it took 10 years until the first Rose-breasted appeared at my feeders. Now they visit regularly. Male Rose-breasted are chunky black and white birds with large white wing patches and rosy underwing lining which is visible in flight. The brilliant red triangle on the breast identifies them immediately. Females look like large, streaky-brown sparrows with big beaks. Their voice is rich whistled phrases, often described as a robin who's taken singing lessons. Black-headed The Black-headed lives throughout the forests of the west. They prefer oak and pine-oak woods, riparian zones, and pinyon-juniper woods. Like their Rose-breasted counterparts, male Black-headed grosbeaks share incubation duties with the female. They eat insects, seeds and fruits and are one of the few birds capable of eating toxic monarch butterflies. They come to feeders for sunflower seeds. Their black head, cinnamon body and black wings with white wing patches distinguish this species. Again, the females suggest a large, chunky sparrow. Males do not acquire their breeding plumage until their second year. First-year males often appear to be in transition between male and female plumage. The Black-headeds' musical phrases are similar to the Rose-breasted and are reminiscent of a Robin. Both sexes sing, even while incubating eggs. Blue grosbeaks occur across the southern two-thirds of the U.S. all the way to Arizona and parts of California. They prefer thickets, forest edges, hedgerows and riparian zones. They eat a wide variety of insects and seeds. 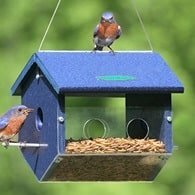 Because they are not a common feeder bird, consider yourself lucky if a Blue visits your feeders. The Blue is considered a large bunting, more closely related to Indigo Buntings than to other grosbeaks. Males are a beautiful deep blue with black face and throat and two chestnut wing bars. Females are dull brown, suggesting a female Cowbird with a large bill. Evening grosbeaks nest in the northern forests of the U.S. and Canada, down the spine of the Rocky Mountains and in the northwest. When a tree seed crop fails, they move south in search of food. 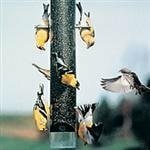 During these "irruptive migrations" evening grosbeaks can be common at feeders. 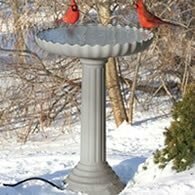 These birds eat mostly seeds and buds. Berries and insects are taken occasionally, and sometimes they drink maple sap. 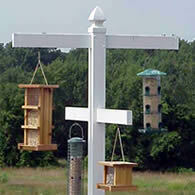 At feeders, a flock can empty a sunflower seed feeder in minutes. At first glance this bird suggests a large Goldfinch. Males have a dark head with a prominent yellow eyebrow stripe and a yellow belly. 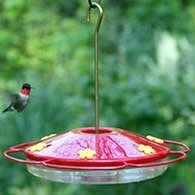 They have a black tail and black wings with white secondary feathers that show as a large white patch in flight. Females are duller but also have prominent white wing patches in flight. Pine grosbeaks are relatively uncommon birds of spruce and fir forests of Canada and the Rocky Mountains. They sometimes move southward when winter food supplies fail. Ironically they avoid pines during the nesting season. 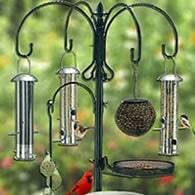 They are primarily vegetarian, eating mostly seeds, buds, berries and some insects. 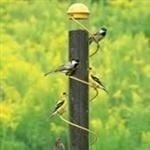 Where they occur, they will visit feeders for sunflower seeds. Male Pines' are chunky, long-tailed finches with a pink or rosy body. Their bill is dark, short and curved, and wings are dark with two white wing bars. The female is grayish with yellowish, reddish, or russet head and rump.